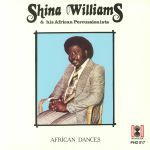 Review: Shina Williams' first album from 1979, African Dances, marked the moment where the Nigerian afrobeat artist would team up with 'His African Percussionists', to form one of the most sought-after sounds of the next decade. Taking inspiration from the Master Of Ceremonies, Fela Kuti, this album is just as loose and evocative as the legend's, and perhaps even a little more oriented towards the disco end of the spectrum. "Cunny Jam Wayo" is a classic afrobeat march, with its rolling drums popping off left, right and centre, while "Agboju Logun" offers a softer funk ride, and "Gboro Mi Ro" lifts the soul at the final moments with a truly memorable string of brass instruments and vocals. Cop this, not the L300+ original..! Review: Shina Williams' first album from 1979, African Dances, marked the moment where the Nigerian afrobeat artist would team up with 'His African Percussionists', to form one of the most sought-after sounds of the next decade. Taking inspiration from the Master Of Ceremonies, Fela Kuti, this album is just as loose and evocative as the legend's, and perhaps even a little more oriented towards the disco end of the spectrum. "Cunny Jam Wayo" is a classic afrobeat march, with its rolling drums popping off left, right and centre, while "Agboju Logun" offers a softer funk ride, and "Gboro Mi Ro" lifts the soul at the final moments with a truly memorable string of brass instruments and vocals. Next online in 33 hrs 29 mins.